After the delayed start to the second day's race programme at the 2015 Classic TT Races presented by Bennetts, the Motorsport Merchandise Formula 1 and Formula 2 Race fired into action at 5pm into the setting sun on the Isle of Man. The much-anticipated head to head between the Japanese Suzuki, Kawasaki and Yamaha Superbikes and the Yamaha YZR500 V4 two stroke Valvoline Racing by Padgetts Motorcycles machine ridden by Bruce Anstey didn't disappoint with lap records tumbling as Anstey, Dean Harrison, Michael Dunlop, Ryan Farquhar and Peter Hickman went head to head. The Valvoline Racing by Padgetts Motorcycles team battled valiantly to fix the problem and the Kiwi continued but he'd lost a minute to Michael Dunlop, handing victory to Dunlop on a plate. 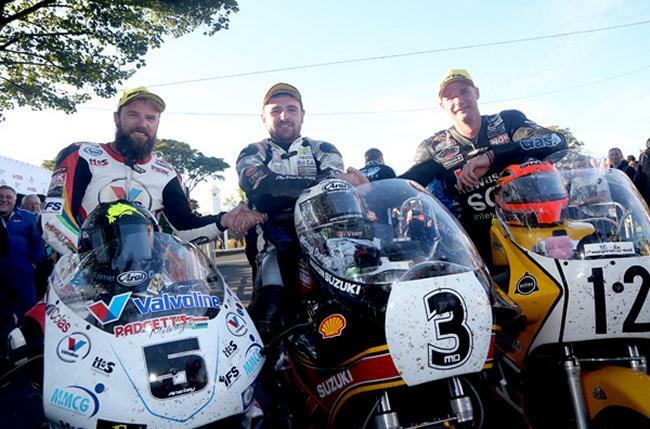 Anstey had the consolation of clawing back a gap of over thirty seconds on James Hillier on the last lap and with Ryan Farquhar losing time on the Mountain section, Anstey snatched an incredible second place by a second from Farquhar. In the concurrent Formula 2 Race, Ryan Kneen took a commanding victory from James Cowton, breaking the old lap record by a minute with Cowton having the consolation of a new lap record in a race that saw the old lap record broken three times. However, Anstey came roaring through to move in front by Cronk Ny Mona and the Kiwi lead at the end of the opening lap by less than a second (124.190/ 18:13.707) from Dunlop (124.094/ 18:14.559mph) with the leading pair both inside Anstey's Formula 1 Classic TT record set (123.894mph) in last year's race. Farquhar held third with Hickman (123.533/ 18:19.530) fourth with just over 2 seconds separating the top four in a hugely competitive opening lap. Anstey lost 15 seconds to Dunlop in the pits with a pit stop of 1 minute 18 seconds, hinting at the problems that were to come on the third lap, and Dunlop duly held a lead of just over a second at Glen Helen on the third lap, which he extended to almost six seconds by Ballaugh although Anstey again came back and by Ramsey had halved Dunlop's lead. Farquhar retained the final podium position but with the Team Winfield man 26 seconds behind Anstey, attention was focused on the leading pair when news came through of Anstey's black flag as they approached the grandstand at the end of the third lap. Dunlop duly brought his Team Classic Suzuki home to win in 1:13.37.628/ 122.987mph breaking his old race record set in 2013 by over a minute in the process with a last lap of 125.050/ 18.06.187) with Anstey's last lap charge putting him in second place almost two seconds ahead of Farquhar. South African Allan Venter (Top Gun Racing Kawasaki) , in 14th was the first privateer home. 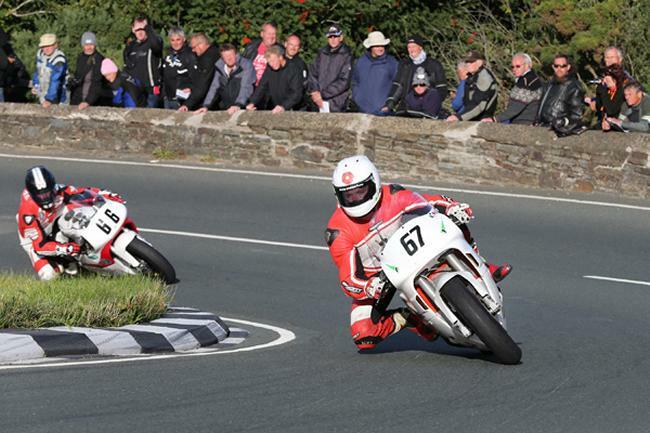 It was the same story in the Motorsport Formula 2 Race with lap and race records being shattered as Ryan Kneen, on the Yamaha took a dominant victory by over 12 seconds from Peter Berwick rider James Cowton, also on a Yamaha. Kneen broke the old lap record on the opening lap with a time of 112.763/20:04.539 which Cowton went inside on his second lap with 113.232mph/19:59.560, the first sub 20 minute lap for the Classic TT F2 Class. Kneen's second lap of 112.890/20:03.192 was also inside his lap one time. Kneen continued to power round the Mountain Course and came home in 1:21.13.592/ 111.481 which included a last lap of 113.075, his fastest of the race, to finish almost 12 seconds ahead of Cowton (1:21.25.526/ 111.208j). Consolation for Cowton in finishing runner up came with his last lap, the fastest of the race, a new lap record for the F2 Classic TT Class of 113.458/ 19:57.162. Charles Rhys Hardisty, riding the EPS Motorcycles Yamaha, came home third, finishing as the leading privateer to boot.